The Psychological First Aid training will provide practical information to attendees to help meet the immediate needs of individuals impacted by a traumatic event. Attendees will gain practical information, knowledge and skills towards provision of Psychological First Aid, in the immediate aftermath of disasters. 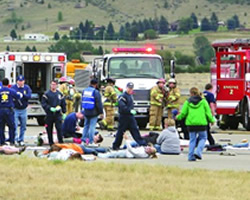 They will receive an overview of the impact traumatic events have on an individual and specific techniques on how to work with individuals impacted by an event. The training will have a mix of classroom instruction and role plays. Particular emphasis will be placed on the 8 core components of Psychological First Aid. Upon completing this training individuals will be able to provide psychological first aid to individuals impacted by an event. The target audience will be local/public health first receivers and hospital preparedness staff, disaster behavioral health workers, Emergency Medical Services, Emergency Management Staff, Medical Reserve Corps and others involved in Disaster behavioral health response. - Participants will be able to identify the eight core elements of Psychological First Aid. - Participants will be able to identify two skills toward the provision of culturally and linguistically competent care in disaster situations. - Participants will be able to report competence in applying Psychological First Aid by describing two skills practiced in the training. 1 - This training program is free 2 - Sign-in is from 8:30 to 9:00 a.m. each day 3 - The training day is from 9:00 a.m. to 4:30 p.m.
Trainings will be offered on a monthly basis from October 2013 through May 2014. Ten foundational Psychological First Aid Trainings will be offered throughout the Commonwealth hosted by partnering organizations such as,local community health centers and state facilities, hospitals, and houses of worship. Locations are TBA (To be announced). At least one training will be conducted in each of the following counties: Berkshire, Hampden, Barnstable, Essex, Worcester, Suffolk, & Plymouth. Course Description The Psychological First Aid – Advanced training will enhance responders’ knowledge of and skills in PFA and provide additional knowledge in how to address the needs of at-risk populations with specific access and functional needs. The training will include a refresher of the topics and skills covered in the Psychological First Aid training as well as new, advanced content providing the latest evidence-based research/practice of disaster behavioral health focused on at-risk populations. Examples of at-risk populations include: youth, the elderly, intellectual/developmental disabilities, etc. Goal The goal of this one day Psychological First Aid - Advanced training is to advance the responders’ overall knowledge of and skills in the eight components of Psychological First Aid and to incorporate advanced topics from selected specialty domains and at risk populations, such as working with children/adolescents, people with disabilities, and elderly populations. Learning Objectives - Participants will be able to enhance their disaster response with Psychological First Aid skills and knowledge in a prompt, efficient and effective manner upon completing this refresher training course which includes a review, and summary of the 8 PFA components. - Participants will gain knowledge about a specialty domain focusing on an at risk population with the latest evidence-based research/practice of disaster health to remain on the “cutting edge” of disaster support. Prerequisite for Psychological First Aid – Advanced Participants are required have successfully completed Psychological First Aid Training or equivalent disaster behavioral health response training and/or experience. Training Details 1- This training program is free 2- Sign-in is from 8:30 to 9:00 a.m. each day 3- The training day is from 9:00 a.m. to 4:30 p.m. Dates and Locations: The Advanced Trainings will be offered in May 2014 on two selected specialty domains focusing on an at risk population. Location are TBA (To be announced).